Manic Street Preachers have spoken about the disappearance of guitarist Richey Edwards for the first time. Just over a year since Richey disappeared, the band have said that they are still open-minded about his fate and are hopeful that he could be alive. They have also hit out at people who believe that the band have any secret insight or knowledge about their colleague. "Once and for all, for all of the stories that are going around, we haven't go a clue. We swear on our lives,” James Dean Bradfield told NME. "We’ve had journalists going up to Martin Hall (Manics’manager) and saying that we know where he is. That really upsets him. There's still the same level of scepticism." 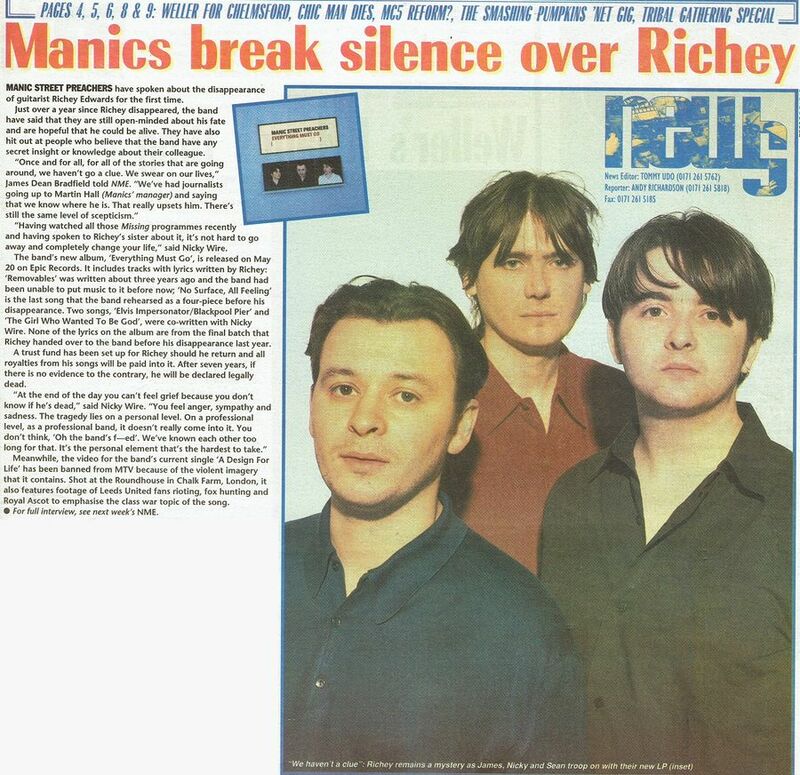 "Having watched all those Missing programmes recently and having spoken to Richey’s sister about it, it's not hard to go away and completely change your life,” said Nicky Wire. The band’s new album, 'Everything Must Go', is released on May 20 on Epic Records. It includes tracks with lyrics written by Richey: 'Removables' was written about three years ago and the band had been unable to put music to it before now; 'No Surface, All Feeling' is the last song that the band rehearsed as a four-piece before his disappearance. Two songs, 'Elvis Impersonator/Blackpool Pier' and 'The Girl Who Wanted To Be God', were co-written with Nicky Wire. None of the lyrics on the album are from the ﬁnal batch that Richey handed over to the band before his disappearance last year. A trust fund has been set up for Richey should he return and all royalties from his songs will be paid into it. After seven years, if there is no evidence to the contrary, he will be declared legally dead. "At the end of the day you can't feel grief because you don’t know if he‘s dead,” said Nicky Wire. "You feel anger, sympathy and sadness. The tragedy lies on a personal level. On a professional level, as a professional band, it doesn't really come into it. You don't think, ’Oh the band’s f—ed’. We've known each other too long for that. It’s the personal element that’s the hardest to take." Meanwhile, the video for the band’s current single 'A Design For Life' has been banned from MTV because of the violent imagery that it contains. Shot at the Roundhouse in Chalk Farm, London, it also features footage of Leeds United fans rioting, fox hunting and Royal Ascot to emphasise the class war topic of the song. This page was last modified on 16 May 2018, at 04:48.